what can you expect on your trip? Seeing whales in their natural habitat can have a powerful impact on people!! Because people can have such an emotional reaction to seeing these animals, we try to maximize the learning potential for our passengers as well. 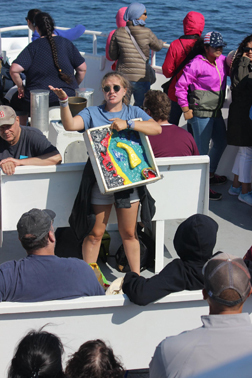 On the ride to and from the whales, our on-board educators will provide hands-on learning tools, for both children and adults alike, to learn more about the whales they will be seeing during the trip, their ocean environment, and about some of the threats they face. In addition to providing something for both children and adults to do during the downtime, this gives everyone on board the opportunity to take advantage of the unique, natural-learning opportunity that a whale watch provides. We believe that education is the key to conservation, and that the fate of whales and their environment lies largely in the choices that we, as individuals, make in our daily lives. Hopefully, the education in combination with the wonderful experience of seeing a whale in the wild will instill awe in our passengers and inspire many people to want to make changes in their lives to help create a safe place for these animals to thrive. - We all have the responsibility to take care of our planet! A 3-D Model of Stellwagen Bank. Stellwagen Bank, one of the favorite feeding grounds of the humpback whales, lies a mere 12 miles southeast of Gloucester. Stellwagen Bank is a large underwater plateau that is about 19 miles long and 5 miles wide. It is situated almost directly in between Gloucester and Provincetown. The top of the Bank is 100 feet deep and it drops off to 200-300 feet deep on the sides. This provides the perfect habitat for plankton blooms in the spring, summer and fall. Plankton, the bottom of the food chain, are food for small fish like sand eels, herring and mackerel. Sand eels, what we typically see on Stellwagen Bank, are food for whales! We have created a 3-D model of Stellwagen Bank so you can better understand how this system works! Whale Baleen and Teeth: There are over 85 different species of whales, and they are divided into two different groups: baleen and toothed. 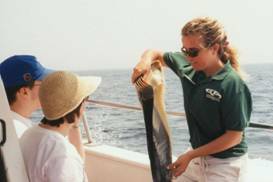 We will bring samples of whale baleen and teeth to you and will explain how the different animals use these to feed. On our trips, we see mostly baleen whales: humpback, fin and minke. On approximately 10% of our trips, we site toothed whales. Humpback Whale Songs: Humpback whales travel south for the winter. The humpback that we observe, travel to the Caribbean—many often sighted around Silver Bank, 50 miles north of the Dominican Republic. While in their breeding grounds, males are often heard singing songs. Dr. Roger Payne and Scott McVey discovered these songs in the late 60’s. Since then, years of research have been dedicated to trying to understand what these songs mean. We have some of Dr. Payne’s original recordings that you can hear onboard!